From Chicago's Buckingham Fountain and Cloud Gate (aka "The Bean"), Illinois is home to some pretty spectacular sights -- especially for being a cornfield-filled Midwestern state. But there’s plenty of natural and man-made beauty in this state that you probably never even knew existed, including hidden waterfalls, flooded forests, and historic structures. Here’s a look at Illinois’ most beautiful under-the-radar spaces. 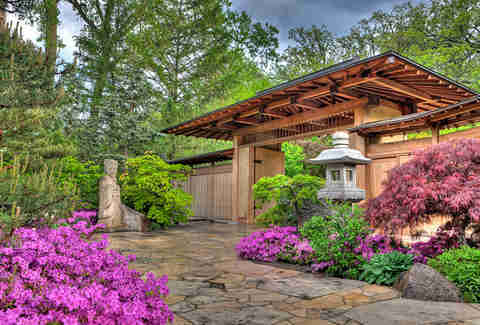 Regarded as one of the most authentic Japanese gardens in North America, this 12-acre sanctuary in the heart of Rockford features waterfalls, a traditional tea house, ornate bridges, rock gardens, and more. If a more serene place exists, we haven’t found it yet. 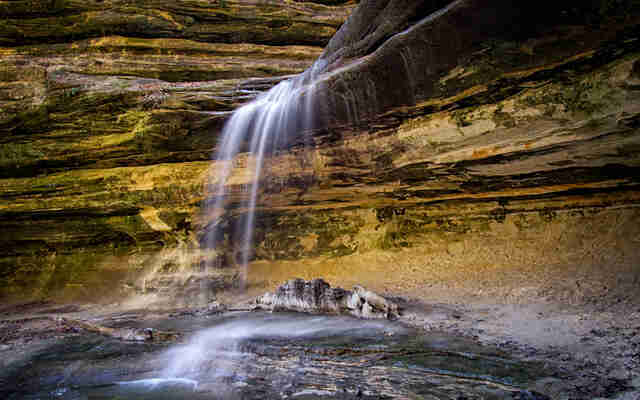 All 2,630 acres of Starved Rock State Park are stunning, but the waterfalls are what truly make a hike through the canyons and trails worth it. The best time to see them is after a heavy rainfall or in the spring when the snow and ice have melted. 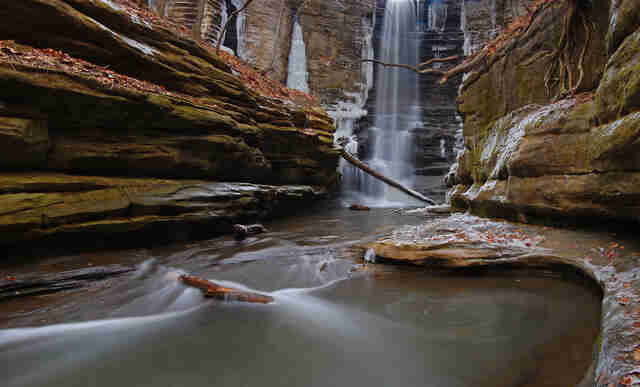 Lauded as one of the highest waterfalls in Illinois, this impressive waterfall is a worthy hiking destination while out on the 400 miles of trails in the Shawnee National Forest, and an even more worthy spot for a seriously beautiful photo op (selfie stick optional). 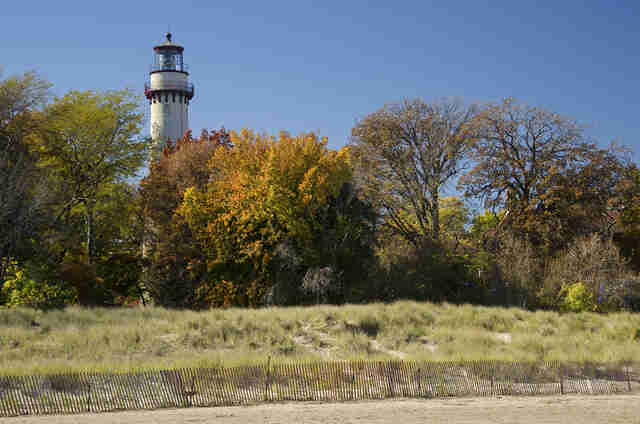 Now considered a national landmark, this historic lighthouse was originally erected in 1873 in response to frequent shipping disasters just off Evanston’s coast. Stop by to tour the space and climb the 141 steps to the top of the tower. Pro tip: treat yourself to a post-climb burger at Edzo’s because, you know, all that stair-stepping is hard work. Virtually the opposite of Chicago's rush-hour insanity, this peaceful scenic drive follows the flow of the Mississippi River for more than 550 miles along the Western edge of the state. The meandering road is home to unobstructed views of the river and the woodlands, and even passes through small Midwestern towns like Galena, Alton, and Grafton. 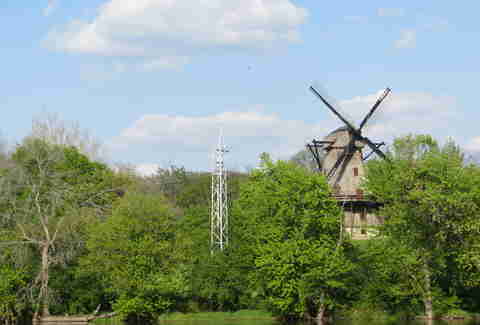 This 68ft, five-story windmill was built in the mid-19th century, and is considered one of the best examples of an authentic Dutch windmill in the United States. It underwent a major and necessary restoration, as the structure had fallen into disrepair, and has been operating as a seasonal tourism site since 2005. 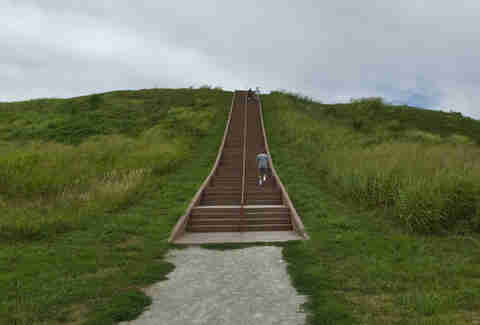 This sweeping 2,200-acre site is Illinois’ one and only United Nations World Heritage site, and contains the remnants of a massive portion of the largest prehistoric Native American civilization in the United States. Climb Monk’s Mound, check out the Woodhenge calendar, and learn about what life in this early city was like at its peak from A.D. 1050 to 1200. 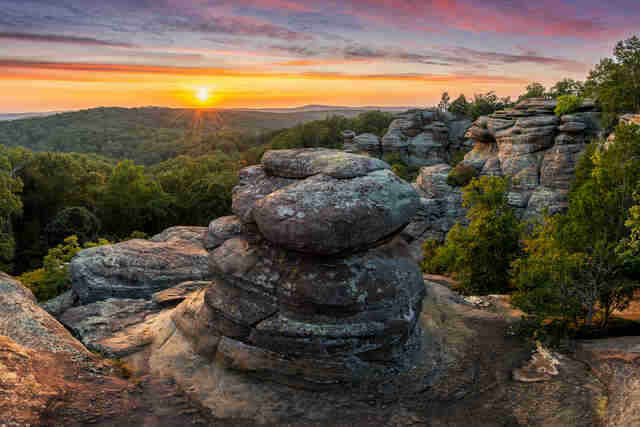 Equally can’t-miss in the Shawnee National Forest is the Garden of the Gods, a jaw-dropping collection of rock formations that Mother Nature’s been working on perfecting for millions of years. The most prominent formations include Camel Rock, Anvil Rock, and Devil’s Smoke Stack. 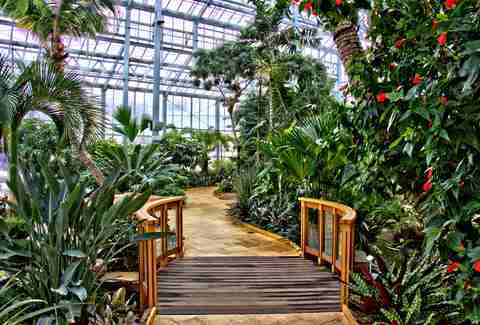 Between its green house-like architectural beauty, lush indoor and outdoor gardens, and proximity to the Rock River, Illinois’ third-largest conservatory makes for an easy day trip from Chicago all year round. Explore the Sinnissippi rose gardens outdoors during the warmer months, and enjoy the tropical plant-life indoors and play hockey on the Eclipse Lagoon in the cooler months. There’s no better time to cruise along this scenic, largely tree-lined road than in autumn when the leaves change colors. Gas up the car and enjoy over 100 miles of natural beauty, as well as manmade beauty like the dam on the Spoon River at Bernadotte, the public boat dock at London Mills, and the historic Ellisville Opera House. The coolest part about this charming park on a bluff of the Illinois River is undoubtedly the Effigy Tumuli, five earthen sculptures molded to look like a snake, a turtle, a catfish, a frog, and a water strider -- all of which are native to the Illinois River area. The second-coolest part? 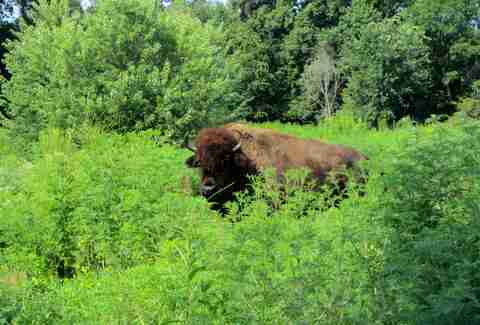 Two furry American bison who call Buffalo Rock home. Don’t let the fact that it’s only 2.52 miles long fool you: this glorified driveway packs killer panoramic views of the Illinois River Valley, and was even called “the world’s most beautiful drive” by President Teddy Roosevelt during his visit in 1910. 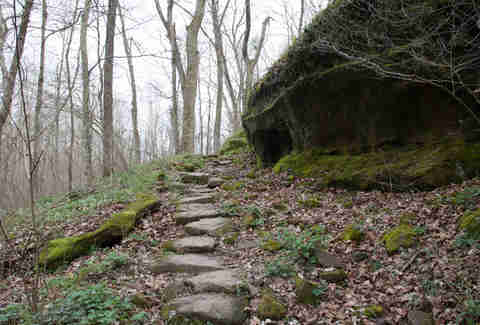 This state park is located near the confluence of the Mississippi and Apple Rivers, and with 15 miles of varied and rugged trails, is a favorite among hiking aficionados. Take in the dramatic cliffs, limestone caves, and wooded ravines, and if you’re feeling ballsy, bring your own rock-climbing equipment and have a go at Twin Sister and Indian Head, two of the most popular rock formations open for climbing. Not far from the Wisconsin border lies one of northeast Illinois' best-kept secrets: the state's only quaking bog, complete with floating sphagnum moss, cattails, and sedges. Follow the winding boardwalk paths through the thriving marshes and prairies, hike the scenic trails, and even enjoy a picnic in one of the designated areas. Travel to the southern tip of the state to canoe through the waters of this perpetually flooded forest. Sky-scraping cypress trees jut out from the algae-speckled water, many of which are over a thousand years old and have flared bases some 40ft in circumference. Cascading from the uppermost part of Matthiessen State Park’s Upper Dells down into the canyon below, this magnificent waterfall is every bit as impressive as nearby Starved Rock’s natural water features, except less traveled. 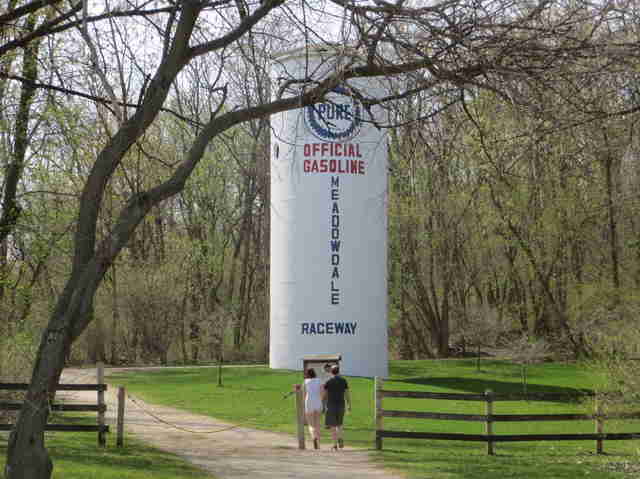 Built in 1958, the now-decrepit Meadowdale Raceway saw a decade of high-speed car racing action before failing to compete with Road America as the Midwest's premier European-style racing track. The 3.27 mile speedway and its surrounding 90 acres have been largely devoured by nature and now operate as a park and nature preserve. Placards around the track provide history and a closer look at its original twists and turns, making it a worthwhile destination for gearheads and casual hikers alike. 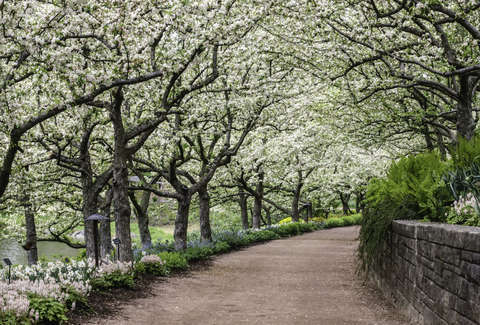 Though arguably the most obvious place on this list, the Chicago Botanic Garden is often the most overlooked, too. 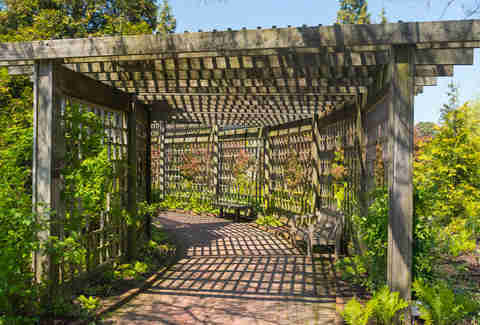 A mere garden, this is not: With 385 acres of flora and fauna, nine islands, 6 miles of shoreline, waterfalls, authentic Japanese and English walled gardens, a model railroad garden, a Bonsai collection, and much more, a trip here can and will easily keep you captivated for the better part of the day. From hiking and rock climbing to fishing and nearly a dozen miles of equestrian trails, this southern Illinois park has something for every type of recreational outdoorsman (or outdoorswoman!). 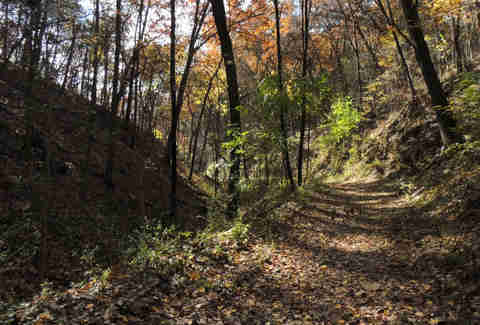 Particularly noteworthy, however, are the "Giant City Streets" along the main nature trail, which are colossal sandstone bluffs formed some 12,000 years ago. If you're looking for unparalleled views that require minimal effort, look no further than Inspiration Point, one of the most isolated spots in the entire state. It’s a quick (but somewhat demanding) 0.8 mile hike up from Wolf Lake, and yields panoramic views of the Mississippi River valley below.